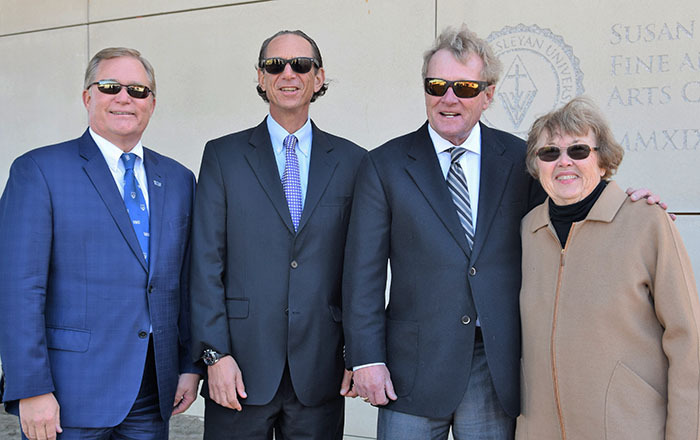 Members of the Virginia Wesleyan University Board of Trustees and the VWU campus community gathered on October 24 for the unveiling of the cornerstone at the new Susan S. Goode Fine and Performing Arts Center. 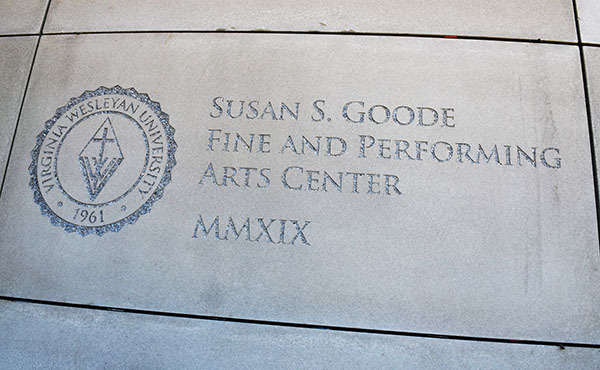 The cornerstone bears the University seal and the name of benefactor and Trustee Susan Goode, namesake of this project and of the Susan S. Goode School of Arts and Humanities. Known sometimes as the foundation stone or setting stone, the cornerstone is the first set into place in the construction of a masonry foundation. It’s important because all other stones are set in reference to this one. VWU Board Chair David Kaufman and other trustees were also in attendance at the ceremony, as were Chris Brandt and Mark Roy, both Executive Vice Presidents of the Hourigan Group, Bob Miller, President and Partner of MSA, and many faculty, staff, students, and VWU arts enthusiasts. The cornerstone unveiling marked the halfway point of construction for the Goode Fine and Performing Arts Center. The University broke ground for the facility in December 2017 and the final steel structural beam was lowered into place on Founders Day in September. The structure will be enclosed to the elements prior to Thanksgiving, and the parking lot will be poured before winter weather arrives. Painting in the back of the theater and restroom finishes have begun, and the glass façade encasing the Eleanor and Henry Watts Grand Lobby will soon be installed. The catwalk and lighting installation is expected to be completed by mid-December so that scaffolding can be removed to make way for installation of 300 seats in the Joan and Macon Brock Theater. The new facility will build on the institution’s excellent tradition in the fine and performing arts while raising the curtain on innovative initiatives and exciting new expressions of artistic achievement. In addition to supporting all of VWU’s fine and performing arts events, the center will serve as a unique venue for visiting speakers, honorary inductions, and awards ceremonies. It will play an important role in educating students of all ages—from Virginia Wesleyan undergraduate and graduate students, to those enrolled with adjacent partners at Chesapeake Bay Academy and Tidewater Collegiate Academy, and the University’s newest students in the Westminster/Wesleyan Lifelong Learning Institute at Westminster Canterbury on Chesapeake Bay. The facility is scheduled to open in late winter 2019. Read more at vwu.edu/goode.